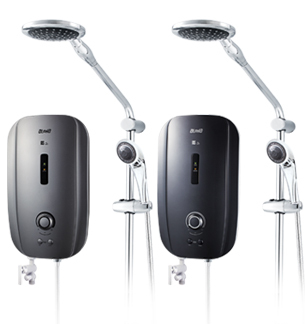 Introducing the Alpha AS - 2 series, the newest, ultra-slim line of instant shower heaters. The minimalist design is inspired by a sense of timeless elegance and style. It is also born out of an international design sensibility that is meant to reflect your own refined tastes in modern interior décor and architecture. This attitude is further accentuated by three colors, metal black or misty silver.. 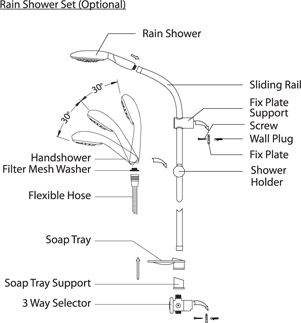 Beyond its design, you will find an amazing level of performance that Alpha has become renowned for making every shower a blissful, rejuvenating experience. The heater only operates when there is sufficient flow. Cuts off current flow if there is a risk of any current leakage. Auto Reset prevents overheating at 55°C. A strong & durable non-conductive material for further insulation against electric shock. protection against water seeping into the heater's internal mechanism. Shower temperature can be selected according to personal preference.